Erlend, my boyfriend, has been growing a bunch of exciting herbs and spices in our garden. I'm especially excited about his gardening because fresh herbs and spices really make a big difference in the cooking/baking process. It's so much more flavorful than the stuff you buy in bottles at supermarkets -- only god knows when those herbs and spices were packaged. If you're lucky, the bottled stuff is only a few months old. Most likely, however, they're years old -- especially if they're coming from one of those fancy herb racks. One of the herbs he's decided to grow is lavender. I adore lavender baked goods -- one of my favorite Hummingbird Bakery Cookbook recipes is actually the recipe for lavender cupcakes with lavender buttercream frosting. I've never used fresh lavender in my baked goods before. I had always used dried lavender in the past -- would fresh herbs really make a big difference? Yes, yes it did. While baking in the oven, these cookies emitted such a delicious and fragrant smell that people walking by my house actually stopped and wondered out loud if there was a bakery nearby! Now that's something you just can't get from a bottled, dried herb. Without further ado, here is the recipe for my honey lavender medallions. 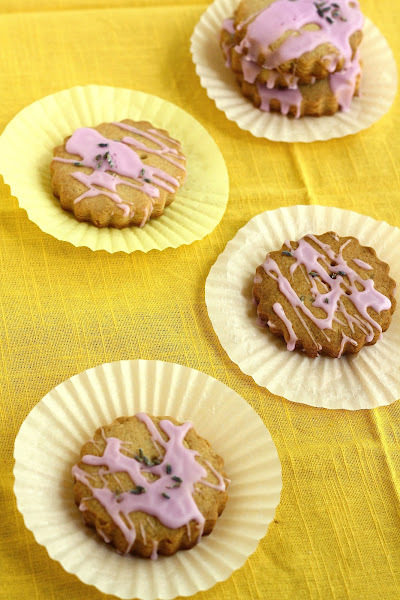 Based off a shortbread recipe, a few tablespoons of additional honey gives the final butter cookie a toasted honey flavor that is complemented by lavender sugar. 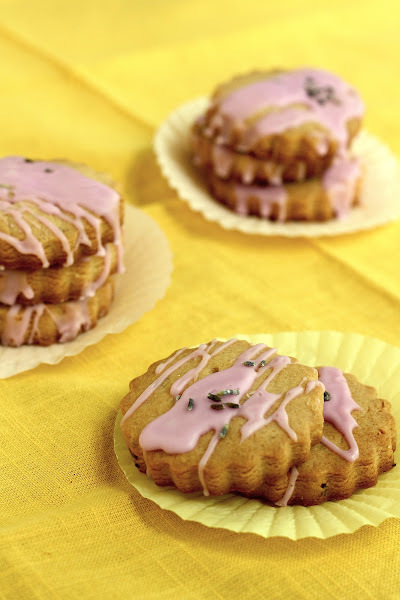 For all those who fear lavender and think it's too soapy in baked goods, don't be afraid -- the lavender flavor primarily comes from the cookie's glaze, which avoids an intense lavender flavor by cold-infusing milk with lavender flavor. On that note, beware that the recipe requires you to prepare some infused milk overnight, so make that ahead of time. Put the 1 1/2 tablespoons milk and 1 tablespoon dried culinary lavender used in the glaze recipe in a small ramekin, cover, and refrigerate for 3-4 hours (or overnight if possible). Preheat the oven to 350 (F) degrees. Line a cookie sheet with parchment paper and grease both the parchment paper and the cookie sheet. (This step is optional but I find it distributes the lavender better) In a food processor, whir 1/3 cup sugar and 1 tablespoon of dried lavender for about a minute until the lavender buds are chopped and distributed throughout the sugar and the sugar has a purple hue. In a medium bowl, sift together 2 1/2 cups all-purpose flour, 2 tablespoons cornstarch, and 1 teaspoon salt. Set aside. Using a freestanding electric mixer with a paddle attachment (or, do this manually with a wooden spoon in a big bowl), beat together 1 1/2 sticks unsalted butter, 1/3 cup sugar, and 3 tablespoons of honey until very creamy and smooth. Slowly sift in the flour mixture and beat just until the dough forms large clumps. The dough should be a little crumbly at this point. Add 1 teaspoon of water from your 2 tablespoons of water and continue beating at a low speed, adding water teaspoon by teaspoon until the dough comes together and is less crumbly. Turn the dough out onto a lightly floured counter and squeeze the dough into a ball. Use a rolling pin or the back of your hands to flatten the ball into a 9-inch square that is approximately 1/4-inch thick. Use a cookie cutter (I used a 3-inch biscuit cutter) to stamp out whatever cookie shapes you want. Transfer the cookie dough shapes onto your greased and parchment-lined baking pan, using the twines of a fork to poke holes in each cookie. Bake for 25-30 minutes, or until the cookies are golden-brown and feel firm when lightly pressed. My oven runs hot, so my cookies were done in 25 minutes. Leave the cookies on the cookie sheet and set on a wire rack to cool for a few minutes, before turning out onto a wire rack to cool completely. Once the cookies have cooled, take out the ramekin of lavender and milk from the fridge. (from the first step in the recipe) At this point, the lavender should have cold-infused the milk full of flavor. Strain the flowers from the milk. Stir together 1 cup confectioner's sugar, the strained lavender infused milk, 1/8 teaspoon vanilla, and food coloring in a small bowl. Stir until the sugar is completely dissolved and the color is uniform. Use immediately to glaze the cookies, sprinkle a couple lavender leaves on top of the cookies. Based on your delicious Honey-Lavender Butter Cookies photos, we'd like to invite you to submit your food photos on a food photography site called http://www.foodporn.net so our readers can enjoy your creations. how much in weight for a stick of butter?